After more than two years of demands that they #FreeTyus, the Minnesota Timberwolves finally did it. An injury to starting point guard Jeff Teague forced head coach Tom Thibodeau to set the Apple Valley native loose Sunday against the Phoenix Suns. In his first start, Jones delivered. The youngest player in the lineup played just under 39 minutes, notching nine points, seven steals, seven assists, four rebounds and two blocks to help the Wolves to a much-needed win. With Karl-Anthony Towns, Jimmy Butler and Co. handling the offense, Jones went to work on the other end, becoming the first Wolves player in nearly two years to have at least seven steals in a single game. He’s just the second player since the 1985-86 season to have at least seven steals in his first start, and trails only Michael Carter-Williams, who had nine in his first start for the Philadelphia 76ers. Jones is the youngest player in Wolves history to nab at least seven, and the eighth in franchise history. It’s only been done 13 times. A fan favorite despite his limited opportunities, Jones was originally drafted 24th overall by the Cleveland Cavaliers in 2015. The Wolves dealt a combined three picks to the Cavaliers to bring Jones back to Minnesota, where he starred at Apple Valley High School before leading Duke to a national championship as a freshman. — The Wizards are just 4-5 against Western Conference teams this season, and 2-3 when playing them on the road. — If the Wolves are shooting well from beyond the arc, they’re probably winning. Minnesota is 8-2 when they make at least nine three-pointers this season, and 6-0 when making at least 10. 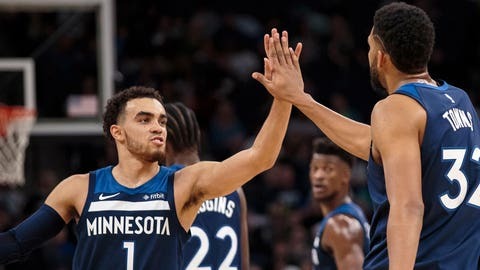 — Towns (32), Butler (25), and Andrew Wiggins (21) scored a combined 78 points against the Suns, the most any Wolves trio has scored this season. — Taj Gibson has been at his best during his first season with the Wolves. The veteran power forward is averaging 31.5 minutes, 7.8 field goals and one steal per game with a .531 field-goal percentage and a .833 free-throw percentage, all career highs.